Flight to Trabzon . Pick up from airport and transfer to Hotel . Pick up from hotel at 12.00 and drive to Akcaabat for lunch . After lunch transfer to Hagia Sophia Museum and Ataturk’s villa. We depart for Sera Lake. After arriving to the lake which is a natural wonder. We have our lunch here in a rataurant with a menu of the dishes peculiar ta this region. Around 3 p.m. we leave the area. You our guests may prefer walking around the bazaar area of the villager women or inside the biggest shopping mall of the citycalled ‘Forum’ as you wish. End of tour transfer to Hotel . Overnight in Trabzon. 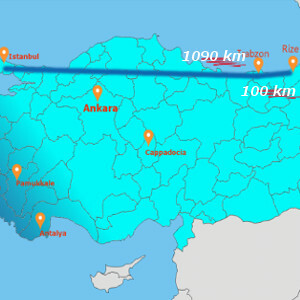 It is 47 km far from Trabzon and it takes 45 minutes to go there. Sumela Monastery having the elevation of 1150m is located in Altındere Village of Maçka subordinate of Trabzon. The monastery which was founded on the step surface of the mount having the view of Altındere Valley is called ‘Mother Mary’ by the local people. This structure which is 300m high from the bottom of the valley has sustained the tradition of the monasteries to be founded outside the city center, in the forests, ınsıde the caves and on river banks. Breakfast served at the hotel. Pick up from airport and continue to ‘Ayder’. It is one of the lovely highlands of the Black Sea which is located in Camlihemsin subordinate of Rize, covered with forests and has an elevation of 1350 m. It is 185 km far from Trabzon andı t takes 2,5 hours to go there. We arrive at the sight-seeing place at 11.30. Ayder seems to be a paradice whose ridge relies on the Kaçkar Mountains. The waterfall ‘Gelintulu’ the area ‘Galerduzu’ and the hot water spring of Ayder make their visitors experlence an unforgettable day. The honeys that are produced owing to the flowers of Kaçkar’s flora, many of which are endemic, can be found in this highland. Thus we have briefly introduced the touristic town to you and so will be done in details by our guide who will accompany you. As it has been mentioned,once we arrive at the sight-seeing place we give two hour free time. After that we have our lunch in one of the cute restaurants of the highland. You may prefer trout fish or local foods as you wish. Then our guests who wish to walk can do some sight-seeing or trekking in nature. At around 2 p.m. we take our seats in our vehicle and leave the highland. We go on our way by seeing the Fırtına River and the historical arch bridges on ıt. Around 4.30 we reach Rize where is our second sight-seeing point and we realize a little city tour. Then we go up to the botanic park one of the touristic places of Rize where is the capital of tea plantation in Turkey. End of tour transfer to Uzungol . Check in Hotel . Overnight in Uzungol . Breakfast served at the hotel. Pick up from airport and continue to Uzungol having the elevation of 1090 m leawes the Alps behind with its step slopes and glorious forest cover. 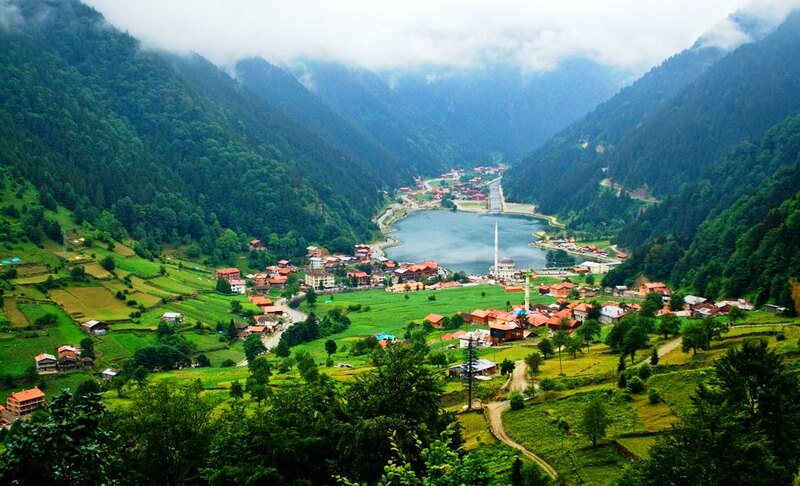 The lake which is located at the middle of the valley and was formed by a landslide having blocked the stream bed is known as Uzungöl and the town around was named after the lake. The houses of the village called ‘Şerah’, which are harmonious with the enviroment, complete the beauty of the nature. End of tour transfer to Trabzon Airport . Evening flight to Istanbul . After arriving transfer to Hotel in Istanbul.